Last year I hesitantly bit the bullet and took down my green, yellow, red chart. Until then, I had clung to it as a security blanket. The funny thing is that I knew it didn't really work several years earlier, but I really hadn't found another system I wanted to try. What I disliked most about "flipping cards" was the focus on bad behavior. I really wanted to find someway to praise the good bahaviors (which actually do happen more often than the bad, it's just the bad is much more noticeable) while at the same time holding students accountable for their bad behaviors. 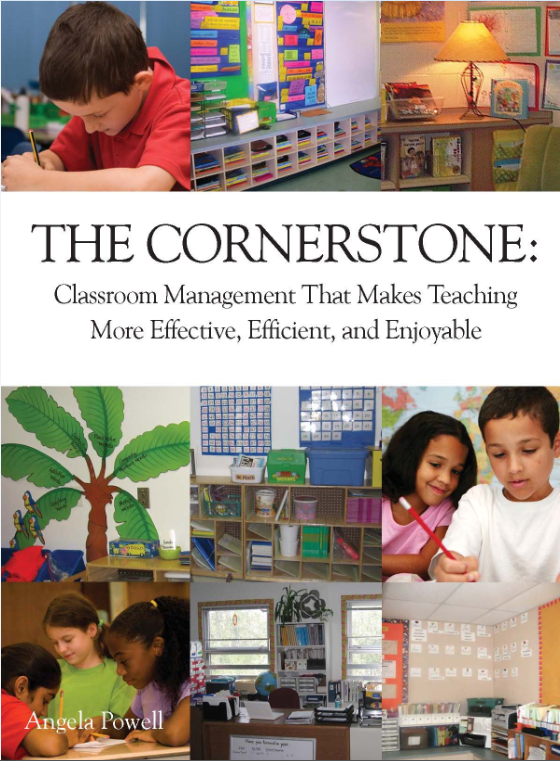 So, last summer I was browsing the web and came across The Cornerstone for Teachers website. Angela Powell has so many great ideas (many for classroom mangagement, but that's not all she blogs about). I was so intrigued by her website I bought her book. In her book she makes this statement, "﻿There must be a balance between teaching students to behave for intrinsic reasons and having something meaningful to work towards. As teachers, we show up to work everyday on time because it's the right thing to do, not because we're expecting a reward...but we wouldn't show up at all if we weren't getting paid at the end of the week." Each child has a pipe cleaner (cut in half) taped to their desk. During the week they have the opportunity to earn beads (pony beads) to add to their pipe cleaner. By the end of the week they need 10 beads (unless it's a short week at school). So, they know the goal is 2 beads per day, but they can earn more or less based on their behavior. They can earn beads for: helping a friend, being the first one sitting on the carpet, walking quietly in the hall, cleaning up without being asked... They learned quickly that if they asked for a bead they wouldn't get one. On rare occasions beads could be lost-- but this was rare. Those that earned 10 beads by Friday, had "Fun Friday." I would get the iPod Touches out and let the kids play apps. By the end of the year some kids prefered to just draw or sit and talk-- most still wanted the iPods. Those that did not earn 10 beads just read from their book box by themselves. Children earned "sick pay" (2 beads) when they were absent. I told them that if I ever saw them stealing beads they would lose all of their beads for the week. The threat must have been enough to scare them. I never had stolen beads. Actually, my sweet friends last year would find beads laying around the room and bring them to me to put back in the jar. The bead system helped to reward good behavior. But, I still wanted some way to report bad behavior to parents. 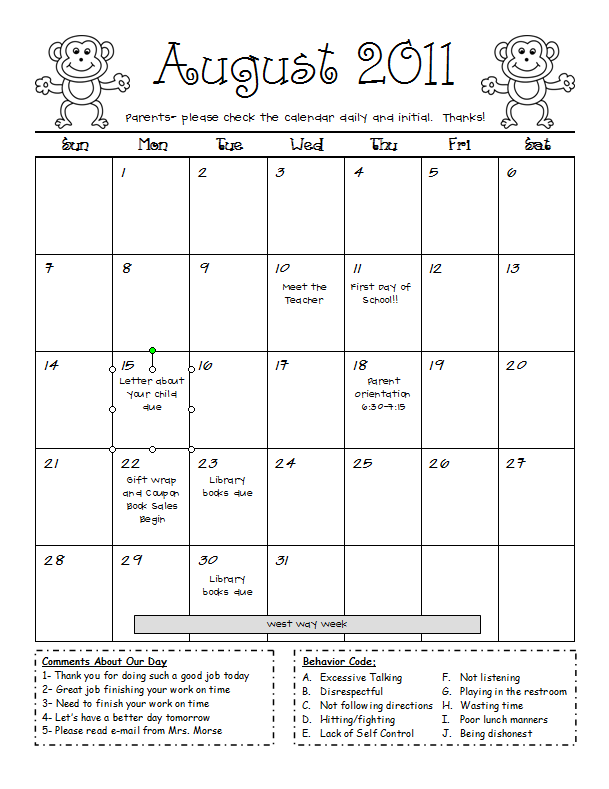 I added a little behavior chart to the bottom of my monthly calendar that goes home with the kids each night. I loved this system last year. It didn't take but just 3 or 4 minutes to quickly write down the behavior code for the day (mostly 1's for good behavior), plus it showed parents issues to address at home. Here's what my calendar looks like so far for August. I'm sure there will be more to add once I get my class list and official school calendar. I have a really simple system for take-home folders. The calender gets stapled on the left side of the folder (the poly kind without brads- Office Depot sells some really sturdy ones) and their papers go home on the right-hand side. Each month I remove the old staples, put the new calendar on top and re-staple all previous callendars together in the folder. 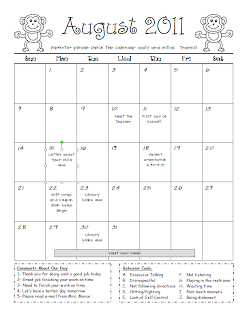 The calendars are great documentation for parent conferences. How do you manage behavior in your classroom? 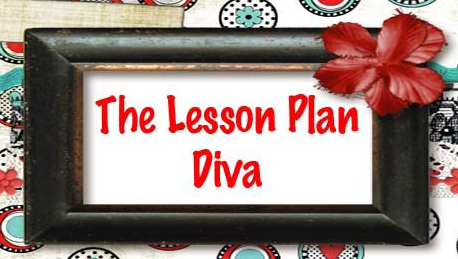 Link up with The Lesson Plan Diva and share your ideas. Thanks for sharing this. I've never heard of Angela Powell. I REALLY like the Bead System. I've always felt bad for the kids who are always well behaved and didn't get the attention they deserved. Question: What do the kids who haven't reached 10 beads do while the others are playing? Andi- It didn't occur to most of the kids that if they reached 10 beads they could stop trying. I think most younger children are so happy to receive the praise that they will keep working to earn extra beads. I generally made a big deal about those earning over ten and would try to spotlight the child with the most beads. A teacher down the hall gave a small treat to children who earned 15 or more (in addition to "Fun Friday" for earning 10 beads). I was also very stingy with beads, so they really had to work for them- ha! Thanks for your kind words about my site! It's so cool to hear how this system worked for you. What about the student who has that split personality who shuts down when he doesn't get what he wants, sometimes to the point of being forceably removed from the classroom? I can see him trying to steal the other kids beads out of spite. Yes, I could easily take any beads he had away, but he wouldn't care because he was already in trouble. Do you ever keep up with who got beads in the event a child had some stolen? I currently use a ticket system and I tell my students it is their responsibility to keep up with their tickets. I don't keep up with any of it. At the end of the week, they put their tickets in a bucket for a drawing for a prize. I usually pull about 5 tickets each week. I love the bead visual reminder, but I am also concerned the kids would play with them on their desk when they are supposed to be paying attention. Have you had this problem? How have you handled it?